The holidays are close, and the time for wrapping up gifts is here. Some rolls of colorful wrapping paper, a dispenser of tape, and some scissors. Oh yeah, and the presents. All these things are fun for us to do. We get a few laughs as we conspire about our gift selections for others. But what about our nosy pups? They’re bound to get a little curious about what’s going on here. If you’re going to be wrapping presents, it’s best to keep those four-legged rascals out of harm’s way. Wrapping paper isn’t exactly the most deadly item in the world, but enough of it would give a pup some serious indigestion. Some folks love to ribbon their presents to add that special touch. Ribbon is pretty, tough, and isn’t a play thing for pups. Like string, they can quickly eat it and end up with a pretty wrapped up intestinal track.Tape dispensers are a definite attractant for a pup that likes to chew. But, the hard plastic can splinter into sharp pieces, and the tape can quickly clog up an intestinal track. Scissors are something else. Although they are usually metal and difficult to break when chewed, those sharp edges can definitely do some gum and tongue damage. 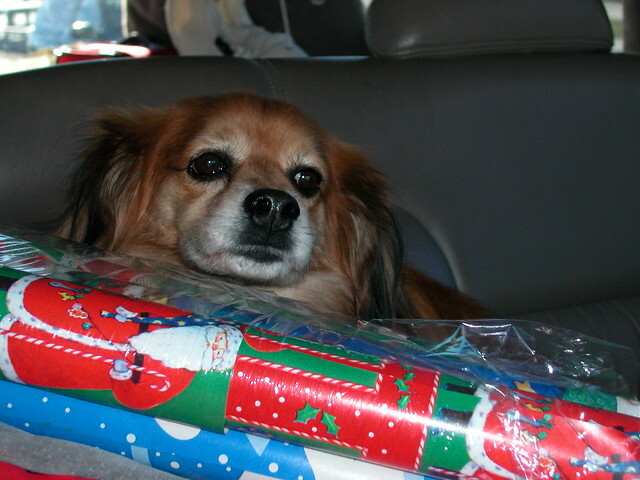 If you’re wrapping presents, keep your pup out of the room- especially if you’re wrapping something for them. After you’ve wrapped everything, keep in mind that clever children aren’t the only ones with mischief on their mind. Under the bed was a classic when I was a kid, but pups can easily get under there and discover a nice gift before that special someone gets to open it for themselves. The best places would be high in a parents closet (for the benefit of the kids) or in the attic where few pups have dared to venture. Wrapping up presents is perhaps more fun than shopping for them, but it’s not something our four-legged friends should partake in. So, close and lock the door to keep your pup safe for the holidays and so that they’ll be just as surprised when they open up their own special present along with everyone else.